Sweet Obsessions has been on my list of dessert cafes to visit for a long time but I never really go to that area (16th and MacDonald Street) and it’s not that convenient to bus there either. Actually that area just reminds me of when I had to take my road test because ICBC is nearby. When my friend said she felt like eating cake for dessert, I suggested this place and it did not disappoint. 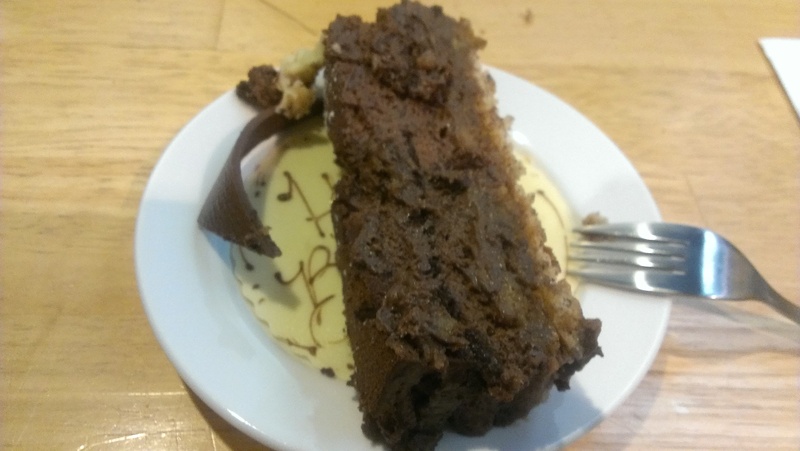 This entry was posted in Cafe/Bakery, Desserts and tagged cakes and desserts, tea. 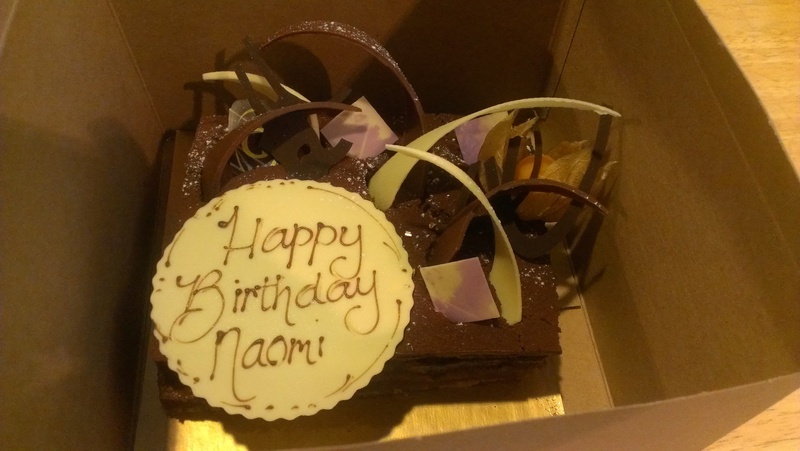 For my birthday, my friends surprised me with a cake from Ganache Patisserie. I’ve always wanted to try Ganache but never got around to it. I’m just not in the Yaletown area very much so I was quite excited to try one of their cakes! My beautiful cake was a 6″ Chocolat Banane topped with chocolate pieces for decoration. The cake was composed of dark chocolate mousse, carmelized bananas, praline crunch and hazelnut dacquoise. We had five people and split the cake into five sections so each person had a piece like the one pictured above. The texture of the cake was very smooth due to the dark chocolate mousse and the praline crunch was at the bottom of the cake and it indeed gave it a bit of a crunch. There was just the right amount of carmelized bananas to balance out the chocolate. The hints of hazelnut rounded out the flavours very well. It was an awesome palate-tickling cake! You can learn more about their cake selection here. I can’t wait to try out their other cakes and goodies! This entry was posted in Desserts, Food Reviews and tagged cakes and desserts, Chocolat Banane, Ganache Patisserie. My friend surprised me with a late graduation gift of cake from Breka Bakery! Yum! I’ve never been there before so I will let the pictures do the talking. This was some sort of Chocolate Cake. It was rich and moist but not too sweet. 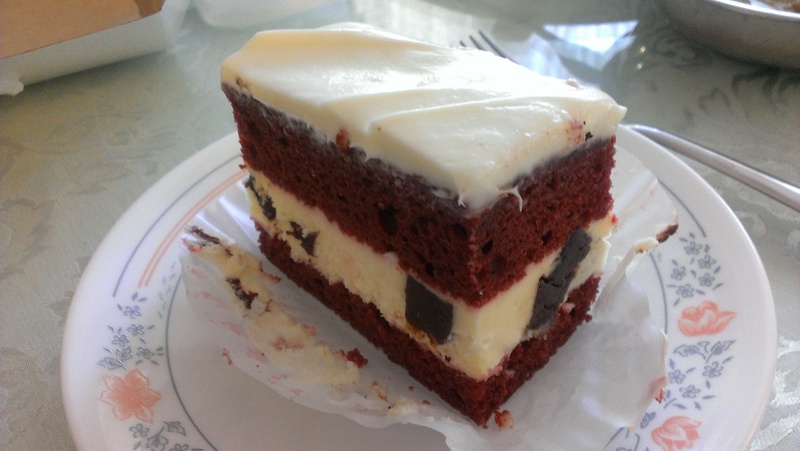 I also had a slice of Red Velvet Cake. The black squares you see in the cream tasted like chocolate but weren’t actual pieces of chocolate. I didn’t like the cream cheese frosting though because it just tasted too much like cream cheese and it was a bit sour to me. I liked the chocolate cake better and I would love to check out their other baked goods sometime! This entry was posted in Desserts, Food Reviews and tagged Breka Bakery Fraser, cakes and desserts. As I previously mentioned, we celebrated my mom and my brother’s birthday together. So I pre ordered a cake from the bakery at Osaka Supermarket in Yaohan. They have really nice boxes for their cakes too. If you pre order they give you 10% off the cake. I chose a chocolate blueberry cake because the shape was unconventional. It was either that or a chocolate banana cake. Yes I have a thing for chocolate… ^^ The cake was $22.49 for 8″ after the discount. Sometimes they have cute animal head shaped cakes like hello kitty or Doraemon and you can pre order those too. The top was coated with cocoa powder and the fruit were all really fresh. The cake was chocolate and the filling was a blueberry jam/jelly in between the cake layers. The cocoa was a bit wet from the fruit though so that’s why there’s that dark patch on the cake. I think the cake was cheaper because there wasn’t real fruit filling in it. But I liked it anyway. I think I care more about how it looks than how it tastes… it was appropriately sweet and the filling didn’t taste weird since I’ve never had blueberry in a cake before I was worried about that. I think we should have gotten a 6″ one since we’ve been eating the cake for 5 days now but don’t worry we picked off all the fruit first so they don’t go bad. 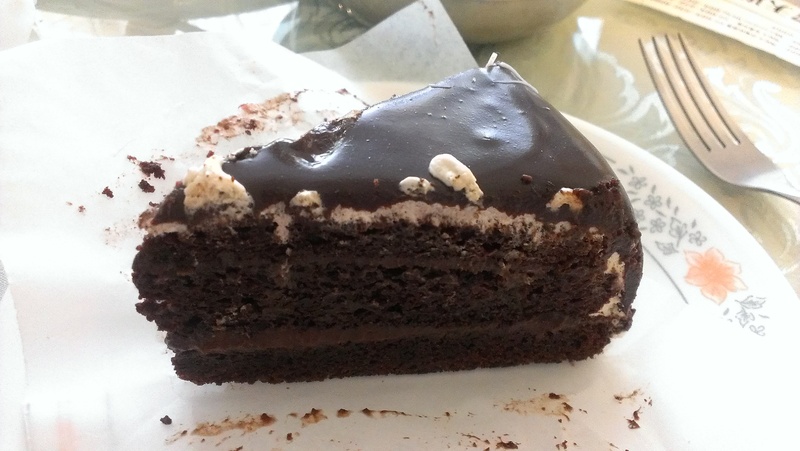 This entry was posted in Food Reviews and tagged cakes and desserts.